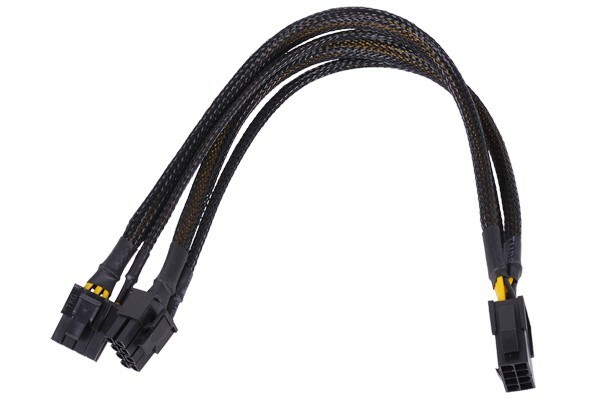 A Y-cable for distribution of the VGA power connector on the PSU to multiple graphics cards.The majority of PSUs is not equipped with sufficient connectors for operation of a SLI or Crossfire system. With only one power connector, it is hard to sufficiently supply power to the second graphics card. The solution is this new Y-cable from Phobya. Ja genau, geht aus den Bildern nicht eindeutig hervor aber die Bezeichnung bestätigt dies. Hello. I was wondering what the wire gauge is on the adapter? Hello it's a normal wire for a Graphiccard. That's working with 12V.